The 45 storey office block was abandoned close to completion. A soaring testimony to the collapse of an economy. It's now home to 750 homeless families. It should have been a Capitalist dream. The third tallest skyscraper in Venezuela, filled with entrepreneurs, investors, the very cream of the banking and industry moguls, towering over the capital. Instead the Centro Financiero Confinanzas was a ruin. Strangled at birth by the death of its financial backer and the banking crisis of 1994, its upper reaches were never built. Only the shell of what could have been remained. Until, that is, it became the tallest squat in the world. When the urban surroundings are as crowded as Caracas, then sometimes the only way to go is up. What's good for business is good for homes. 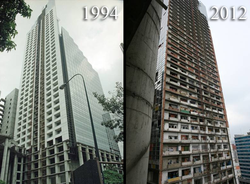 Without the people, Torre David would be a worthless ruin. It would stand testimony only to a turn of the Wheel of Fortune, which took dreams and left them to rot. With the people, it looks like art, or poetry in motion. The skyscraper has always seemed symbolic of something. The state of it reflects the city from which it grew. What happens to Caracas, happens to this construction too; and, as this is the capital, perhaps it also speaks of Venezuela as a whole. Or that could just be the artists and the poets pointing bardic fingers to convey a message. When David Brillembourg financed the Centro Financiero Confinanzas, it was meant to be a shining beacon of Venezuelan wealth and business prosperity. On board was the distinguished architect Enrique Gómez. His construction was modern, luxurious and it gleamed! Its future residents were going to be from the elite in Caracas society. The whole development yelled loud and clear that the Venezuelan economy was stable and booming. Until it wasn't. Work had to pause when Brillembourg died and the money momentarily dried up, while his estate was put in order. It stopped forever when a banking crisis hit a year later. Now the skyscraper appeared exposed to the elements. Nearly completed, but for its higher reaches, as if it had reached too far. Locals called it the Torre de David (David's Tower), like there was some parable of Biblical proportions in this carbuncle. The lessons weren't difficult to discern. All the wealth in the world couldn't save you, if the market turned against you. Luxury left to the whims of the weather will spoil as easily as the lesser people's lot. But then came the community. Homeless individuals and families, who saw in that towering edifice shelter for themselves. There were no lifts and half of the staircases were gone, or never completed. They used ladders and pulley systems to cart furniture up above. They made homes in the shells of half made offices. They created informal grocery stores and butchers' abattoirs high above the ground, to save the legs of their weaker members. Torre David it is called. A symbol of resourcefulness and a dispossessed people refusing to crawl into a gutter to hide. Or perhaps the message is still political - don't waste space, as you would waste lives and prospects. Or is too much being read into this. Is it still a tragedy, when the wind whips through unbuilt walls, even when the homes within feel like poetic justice? The skyscraper has always seemed indicative of the city beneath. Right now, it's the tallest squat in the world; and hope and home to 750 impoverished families. The families of Torre David are not there legally. They live in squalor and they do not pay rent. The only reason that the Caracas authorities have not evicted them en masse is because it would be prohibitively expensive to do so. Plus they would have to find homes for them in a housing crisis. The building is now owned by the Venezuelan government, but they've been content to let it rot. They haven't the funds to do much else. Meanwhile the homeless people keep on coming, pressing ever higher, up ladders and insecure stairways, to colonize ever more unstable open rooms. They have no choice. There is nowhere else to go. There are no rules, no laws and no leaders. It all seems to work rather well. The people who live in the half-finished skyscraper have not been idle. Bricks and bags of cement are hoisted up several floors to fix walls or create living spaces. It's hard and dangerous work, but if it benefits the families, then it's worth the effort. People may live and survive without ever descending to the bottom, as long as they can pull their weight above. Over 2,500 individuals are there now. This is a co-operative society. The community works together to create sacred spaces for worship or to make collective decisions for the good of all. They have made shops, alongside gyms and other leisure facilities, all ad hoc and built from salvage. Running water has now reached as high as the 22nd floor, once the Torre David people worked to install the pipes. Some homes have improvised electricity. An unlicensed dentist has a practice in one room. It's this collective enterprise and resourcefulness, which has attracted the attention of documentary makers. The most famous of those is Alfredo Brillembourg, the artist and architect nephew of David himself, along with his partner Hubert Klumpner and the Urban Think-Tank team. Their documentary movie will be out shortly. All of that effort cannot lead to a long-term solution to the housing crisis; and the current situation is nowhere close to ideal. 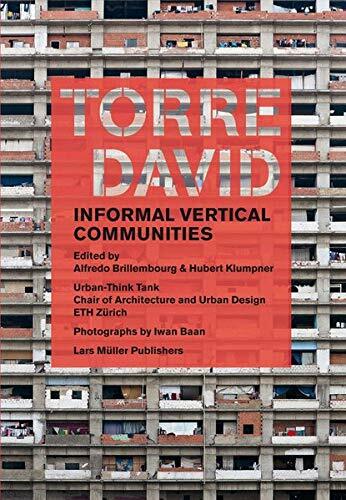 While the community feeling in Torre David is undoubtedly something to be admired, there is a danger that the reality could be lost in the romance of it all. Those most likely to dance at the demise of this Capitalist dream are those who don't have to live there. Torre David is located in the heart of the financial district, in the capital city of Venezuela. It's surrounded by wealthy policy-makers, who do not like having a lawless tenement slum in their midst. As soon as the economy rises again, then the future of the squat is inevitably in destruction. Those brilliant views of the city also mean that the wind rushes relentlessly through makeshift homes. The exposure can kill. The open balconies mean that children play on perilous ledges. The risk of falling is constant. The heights may provide some sanctuary from being moved on by police officers, but it's exhausting just gaining basic amenities. Running water reaches to the 22nd floor. Families are living as high as the 30th; and there are no guard rails on those staircases and ladders, as they haul their buckets up there. From the outside, it's a thumb in the face of the 'haves', whose space is now over-run by the 'have nots'. From the inside, it's still poverty and the failure of a country to provide for its people. Thank you very much. It's amazing how resourceful the human race can be, isn't it? 2uesday - they had nowhere else to go. It was either up there or on the streets. Yes, it's very illuminating. Hollie - I hope that they're never evicted either, but I can't see that being the case. It's prime real estate in the middle of the financial district. It's a fascinating story isn't it? A strange mixture between Heaven and Hell; with political, sociological and all kinds of different angles story to tell too. Wow. I wouldn't want to live there (of course, I'd rather head for the woods anyway. but it's amazing to hear about the cooperative spirit there. We could all use a little help now and then. Great story.